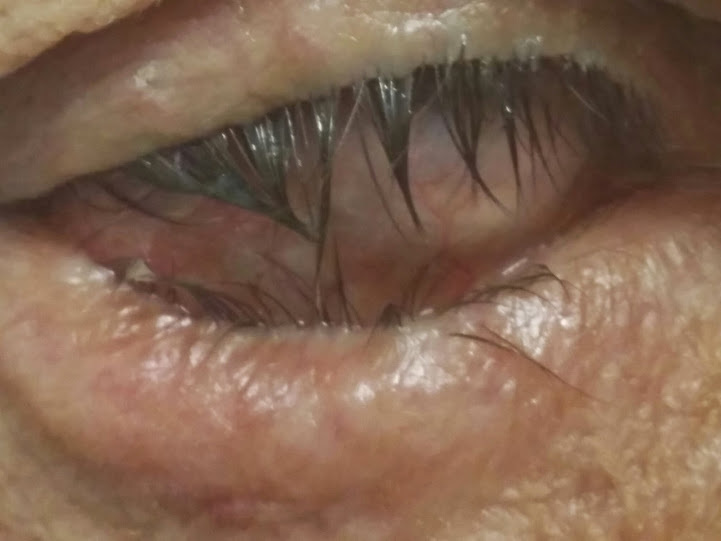 77 year old with chronic irritation of right eye. Describe the pathophysiology of the condition that you see? The lower lid is turned inwards with the eyelashes rubbing against the cornea and conjunctiva. This is called Entropion. Entropion is characterized by inward rotation of the eyelid margin which may result in pain and corneal injury.The etiology may be involutional,cicatricial, spastic or, rarely, congenital. Involutional entropion typically involves horizontal eyelid laxity with dehiscence of the eyelid retractors and override of the preseptal over the pretarsal orbicularis oculi muscle. Spastic entropion is due to excessive contraction of the orbicularis muscle (see attached Figure). Cicatricial entropion involves a tight posterior lamella due to scarring of the conjunctiva and/or tarsus. This scarring may result from trauma, surgery, or cicatrizing conjunctivitis due to infection (e.g., trachoma), topical medications (pseudopemphigoid), or a systemic disorder such as ocular cicatricial pemphigoid (OCP) or Stevens-Johnson syndrome. The etiology of the entropion must be understood before proceeding with treatment.